This is a traditional recipe from the state of Andhra Pradesh. Allam means ginger and pachadi is a kind of chutney. 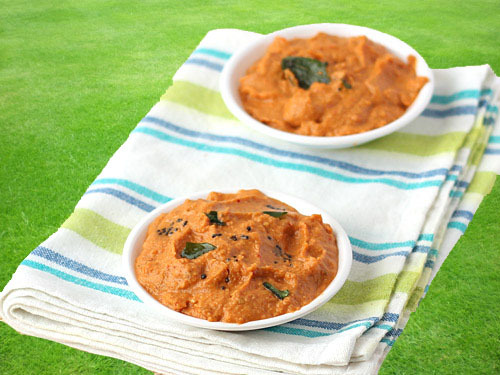 South India is known for its numerous varieties of chutneys and pickles. 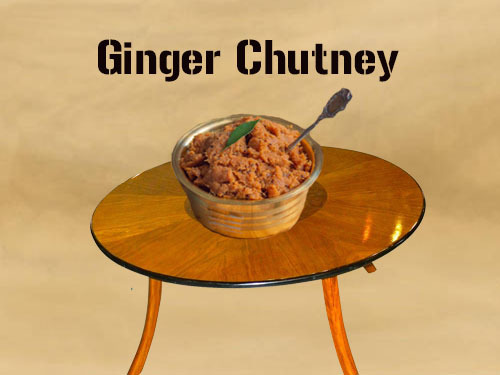 This ginger chutney is a unique one. Zesty and biting and at the same time sour and slightly sweet! Thats how this is, full explosion of flavour. This Recipe is a perfect balance amongst sour, hot and sweet flavours. The piquancy of ginger is toned down by the sourness in tamarind. 1.The amount of tamarind depends on the strength of ginger. After you ground the paste, taste and check. If you need to add more tamarind, soften it by frying on a pan, grind and add to a paste. 2.While grinding, add water only if needed. If there is more water, it wont stay for a long. To keep allam pachadi for a longer time, there should not be excess moisture. 3.You can also halve the quantity, add a little more water to make it a semi solid consistency and use it immediately. 4.Have this in moderate quantity. Overeating ginger is not good for the stomach. Since it is hot and spicy, a little bit on the side goes a long way. 1.Wash, peel and chop the ginger into small pieces. 2.Heat oil in a kadai or a skillet on medium flame, sauté the ginger pieces until they turn golden brown. Remove and keep aside. 3.Then in the same skillet, fry the channa dal, coriander seeds and urad dal separately, until they all turn golden brown, for about 4 to 5 minutes on medium flame. Then add the red chillies and fry it. 4.Cool all the ingredients. Grind all the ingredients coarsely except ginger.Then add the ginger and grind it to a smooth paste. Add little water while grinding. 5.In the same skillet or kadai, heat sesame oil on medium high flame. Once the oil becomes very hot, add the mustard seeds and let it splutter. Use a splatter guard. 6.Turn off the flame, add the curry leaves. Add the ground chutney to the skillet and stir well in the residual heat of the skillet. 7.Transfer it to a mixing bowl. Check for salt and adjust. 1.Use reduced amounts while serving since it is spicy. This stays in the refrigerator for about one month. Once the chutney is completely cooled, transfer it to an airtight container and keep it in the refrigerator. 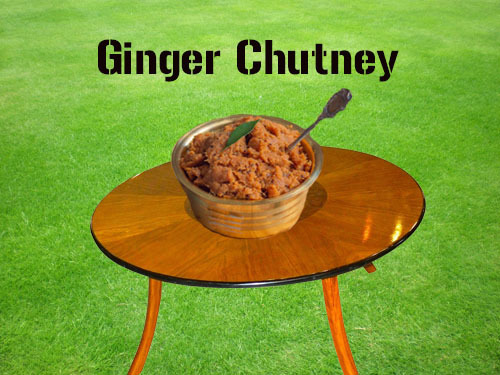 Calories mentioned for 1 tablespoon of ginger chutney.